There is perhaps one venue whose name is carved deeper than any other in the hearts of every self-respecting British music fan. 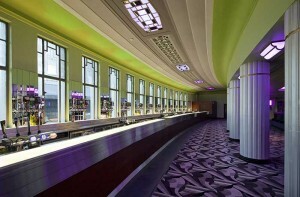 Opened in 1932 and designed by Robert Cromie in Art Deco style as The Gaumont Palace cinema, it was renamed the Hammersmith Odeon in 1962, later the Hammersmith Apollo and now after an extensive refurbishment that has restored it to its former Art Deco glory, it will be known as the Eventim Apollo. For a certain generation, this Grade 2 listed building has and will always be known as Hammy O. Ziggy Stardust was killed off there, Motorhead wouldn't sleep until they got there and it was there that Thin Lizzy recorded, some would say, much of the greatest live rock album of all time. No matter what age or genre, it remains the ambition of musicians across the world to tread its boards and its future programme attests to the fact that this is a situation that is unlikely to change any time soon. 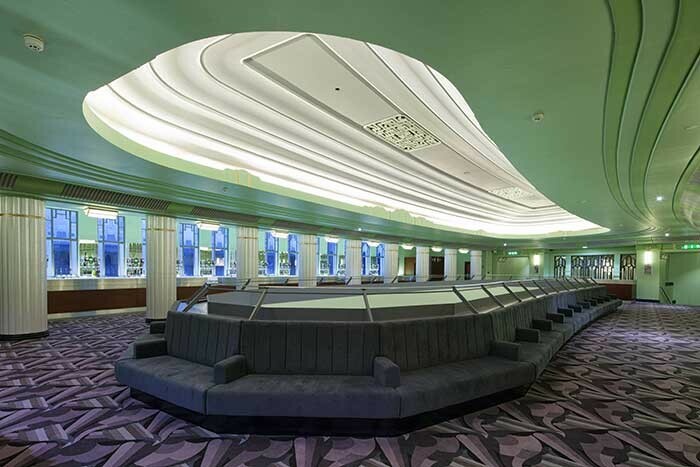 When GDS were commissioned to work on the refurbishment of the Apollo, it was nothing short of participating in the restoration of what thousands would consider a national monument. 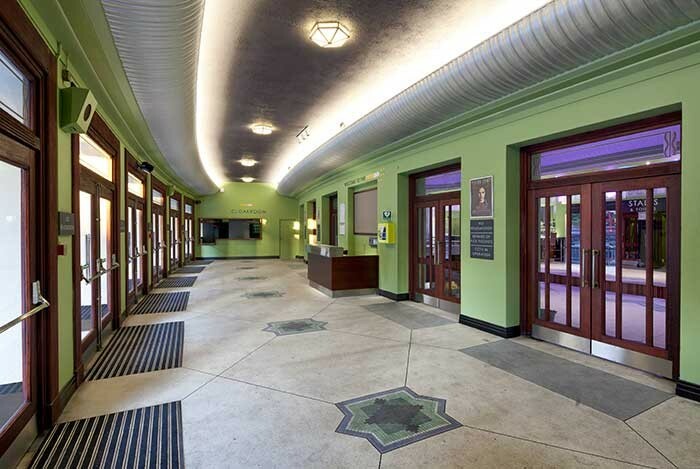 The overall task was one of restoring this magnificent Art Deco building to its former glory. Over the years, the interior of the Apollo had become something of a jaded, dark space and as such, a shadow of its former self. 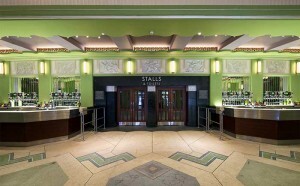 The first phase of the refurbishment involved the front of house areas, including the hallways, staircases and bars. GDS was invited to join the design team tasked with the restoration. The vision was to work within the fabric of the original 1932 Robert Cromie masterpiece and wherever possible restore the historical fixtures. A collection of historical photographs detailing the Apollo's early splendour provided a template from which to work. Using the aforementioned photographs for reference, GDS managed the manufacture of the new light fittings as well as refurbishing the original 1932 chandeliers. The GDS team fitted new and original fittings with its new RGBW colour changing strip, designed to achieve an even coverage of light throughout, and running at up to 70W per metre, it easily matched all compact fluorescent benchmarks that were given. Created specifically for this job the new strip light carries a dedicated white cell (2700K) in order to provide the perfect colour temperature and is now a standard item in the ArcSystem range. In addition to the newly created strip lights, the installation also featured ArcSystem MR 16 fixtures across the foyer. The installation used a whole DMX universe that exceeded the normal ARC system 64 channel capability. LumenRadio were glad to help by providing an integrated CRMX OEM solution that connected perfectly with the ARC system electronics. Of critical importance to any refurbishment solution is the need for work to progress quickly and the Apollo was no exception. 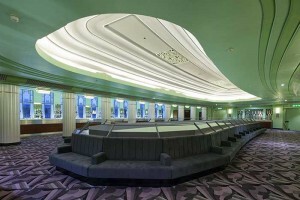 The work was completed in a nine week turnaround and delivered a complete transformation of the whole space. Chief lighting designer Jim Morse offered this view of GDS' contribution: "From the outset, the GDS team was completely committed to the project. They were technically very sharp, very dynamic and always demonstrated a positive approach to problem solving and working with other parties involved." GDS chose LumenRadio's CRMX technology on this prestigious project because it was essential to deliver a large number of DMX channels to certain fixtures which could not be cabled. Frame integrity as well as flawless data transfer was an absolute requirement for Hammersmith Apollo and this is one of the many performance areas where CRMX really excels. GDS MD Matt Lloyd underlined the value of GDS' existing relationship with LumenRadio: "We have worked closely for a number of years with LumenRadio on some of our wireless product ranges. GDS recognises that the combination of reliable wireless, RDM feedback and top quality support offered by LumenRadio is of the highest order and consequently they were the obvious choice for this project." Peter Kirkup VP Entertainment for LumenRadio added: "GDS has been a great partner to us for many years, and their professional team is a joy to work with. We were of course delighted and very proud to work with GDS on this fantastic project. The Eventim Apollo demanded the highest standards and we are confident that LumenRadio perfectly met its requirements in contributing to the restoration of this iconic venue."